Enjoy this variation of Texas Hold’em and play against the dealer to earn yourself a significant bounty in this popular virtual table game. Unlike other casino games you will be required to use real-life money chips and battle it out with some of Texas’ biggest southern warriors. Founded in 1996, Net Entertainment has taken the online gaming world by storm, becoming one of the world’s most successful online casino operators. With unique, premium experiences, NetEnt have many award-winning games, all with their own look and feel. Having won Slot Provider of the Year, Innovation in Mobile and Mobile Supplier of the Year at ERG 2015, it is safe to assume that this developer is doing their job well in the online slot market, however they have also branched into other markets of online casino entertainment. NetEnt have skilfully recreated a reimagined classing table games such as Texas Holdem and Blackjack, allowing the player to choose the stakes from the comfort of their own home, which can be just as immersive as the traditional casino experience. Their passion for casino gaming is reflected in their huge number of awards over a twenty-year period, and the fact that they now serve over 170 of the world’s most prominent online casino operators. Another classic NetEnt table game; Texas Holdem High Limit is a highly popular game, which has been designed with simplicity and elegance. It is recommended for those who do not have to worry about their budget, and are reasonably skilled at poker. Texas Holdem High Limit is actually one of the most popular poker card table in the present day. You will see it played at tournaments, in casinos, and casually in poker rooms. If there is one game to play to enjoy a full casino experience, it is this. With a 1.00 minimum and 40.00 maximum ante, this game can be highly thrilling for the avid poker player, who will find it both familiar and refreshing. NetEnt has added its own quirks to this game, which I feel add nicely to the online casino gaming experience. Although the traditional poker terms are used; High Card, Two Pair, etc., occasionally the game brings in its own quirks. Two 6’s, for example, are brought up as ‘Route 66.’It is a nice addition to a familiar game. One thing that immediately strikes you about the game is the rapid pace of play. Each round can pass extremely fast, with great animation speed and no waiting times. The only thing the computer waits for it your own decision! It allows for highly satisfying play, and it quickly reels you in. As long as you are aware of your chances of winning after the Flop, Turn and River, Texas Holdem High level is the perfect game for you. 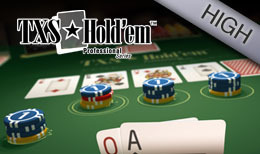 If you are not as experienced, NetEnt’s Texas Holdem Low Level is a great introduction to the game, and will allow gradual progression to this classic table game. The more skill you gain, the higher chance of beating the dealer you have, and the more satisfying the game. Texas Holdem High Limit is part of NetEnt’s Professional Series, designed along with other great classics such as Blackjack, Baccarat, and Roulette. The Professional Series has brought the very best table games to the iGaming industry, and it has been a great success. The game has been beautifully designed, and the speed and simplicity of gameplay only adds to the appeal. The avid poker player would have a fantastic experience playing this game, with its easy playability, potential for high returns, and pleasing design. To see more casino games just visit our homepage.